Kevin first started the violin at the age of 12 under the tutelage of Daniel Trgina. His passion for violin playing also extended to chamber and orchestral music, and at 15 joined the Malaysian Philharmonic Youth Orchestra. He was soon promoted to principal of second violins, and toured to Australia in 2012 with the MPYO. He was thereafter invited to participate in the English Schools Orchestra in London in 2013, and performed in the Cadogan Hall. He also toured around Asia with the Asian Youth Orchestra in 2013 and 2014, which was led by Maestro James Judd alongside with soloist Steven Isserlis. In 2013, he went to Wells to further his studies with Catherine Lord. At Wells, he was co-leader of the Symphony Orchestra and String Orchestra, and performed as soloist for the Vivaldi Four Violin Concerto. His tours with the school orchestras brought him to places such as Milton Court, and to countries such as Germany, France, Switzerland and Luxembourg. 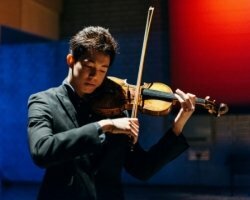 He now studies under Leland Chen at the Royal Northern College of Music, where he is under a full scholarship sponsored by the Thomas Jelllis Bequest Fund. Kevin plays on an 1817 Nicolas Lupot, very generously loaned by the RNCM. Tutored younger students as part of youth orchestra projects. Helped prepare individuals who were aiming to sit for their graded instrumental exams. I believe that technique is meant to serve music, and hence place equal importance in developing musical understanding as well as having a firm grasp on basic techniques.